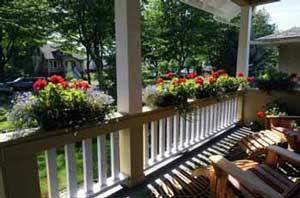 We are often asked "What easy or cheap decorating ideas can I do to decorate my porch?" Or, "I'm not a great decorator. What can I do that's easy and looks good?" 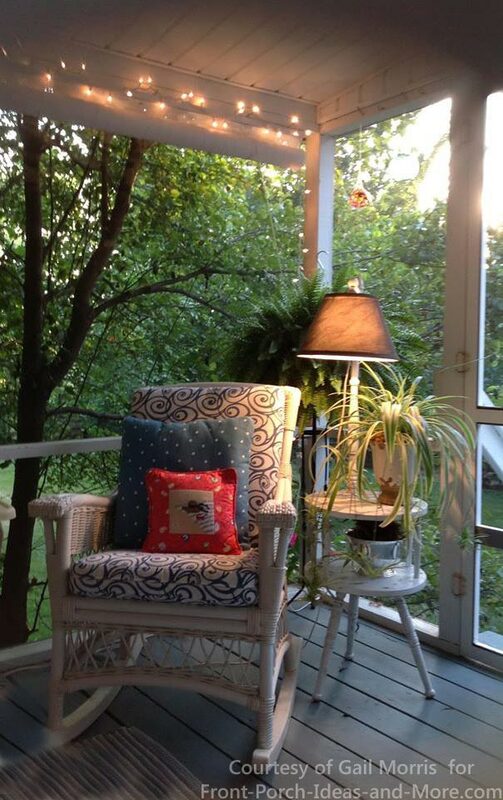 Decorating a porch is much like decorating any room of your home. Think color (or decorating color schemes), theme, focal point and purpose. We explain each of these concepts below so you can quickly incorporate them into your porch decorating. You can do an amazing decorating job just by using color. Not good with colors? Neither am I.
Mary and I often pick the 'wrong' color before we find the one that both of us really like. Sound familiar? We have a nifty Color Guide to help you wade through colors. We even added colors that correspond to architectural styles (colonial, cottage, Victorian, etc., - how neat is that? Our guide should definitely speed up the color choice dilemma. 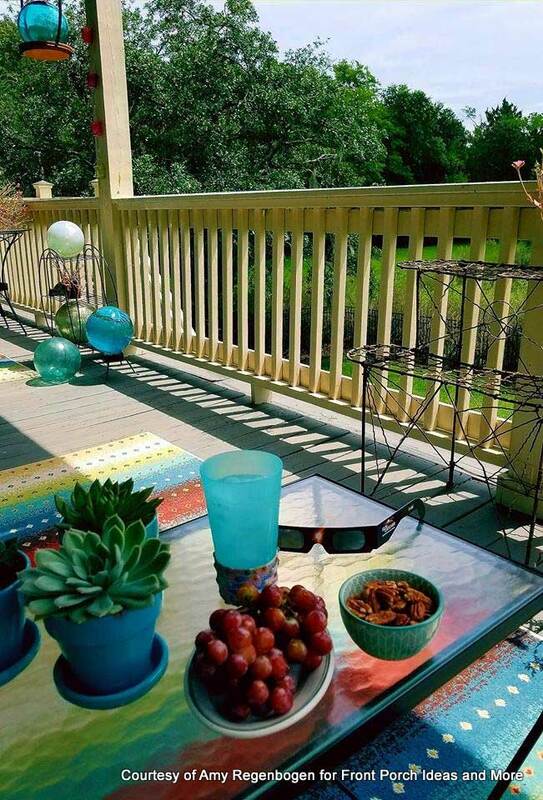 Like activity and conversation on your porch? Go for warm colors like yellow, orange, and red. 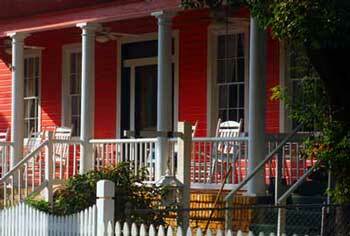 A small dose of red can wake up a porch. Perhaps an intimate dinner and or curling up with a good book is more your style. Then passive colors like blue, green, or purple should be your choice. We make it easy. 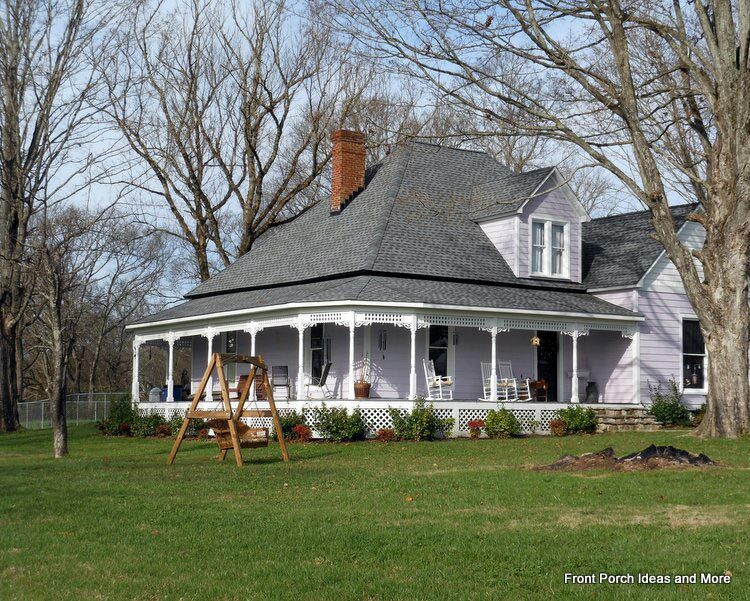 Is a farmhouse your style? Most of us have at least some type of look we'd like for our porch: country, Victorian, Southern, contemporary, southwestern, or eclectic. Or perhaps you want a seasonal look depending on time of year. Some prefer a nautical look - especially those along the coast. Others, like in the Southwest, may prefer a western theme. 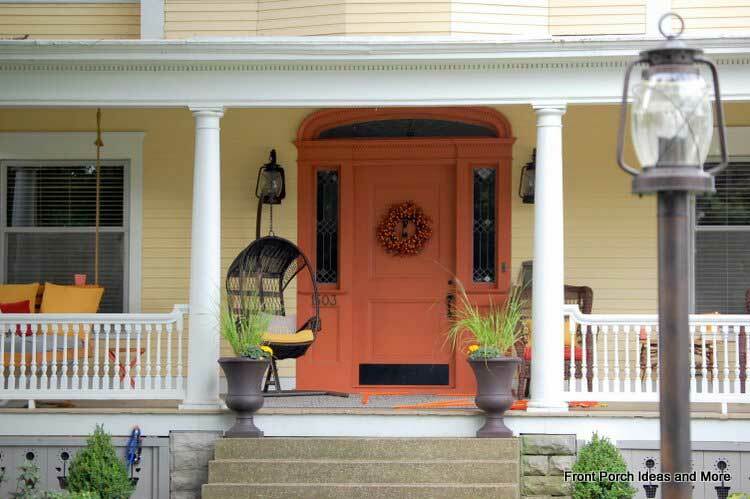 Having a theme will help determine the items you want to display on your porch. Look at garage sales, flea markets, your dollar store, or a thrift shop to find items like pictures for your wall, furniture, tables or other charming knick knacks to carry out your theme. 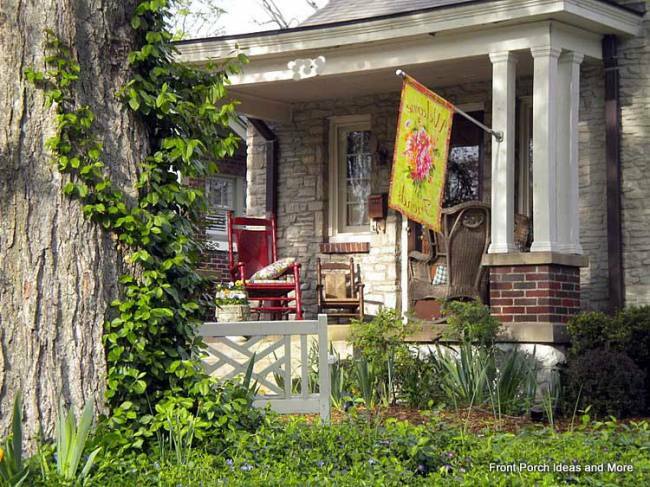 Chances are you have some items in your home already that you can re-purpose for your porch. A focal point can be anything from a great wreath on the front door to perhaps a wicker table, chairs, and table cloth. Or, it could be beautiful hanging baskets, a work of art (painting or sculpture), or your favorite porch rocking chair or the best of all, your porch swing. Make your focal point "obvious". It should be a great conversation starter. 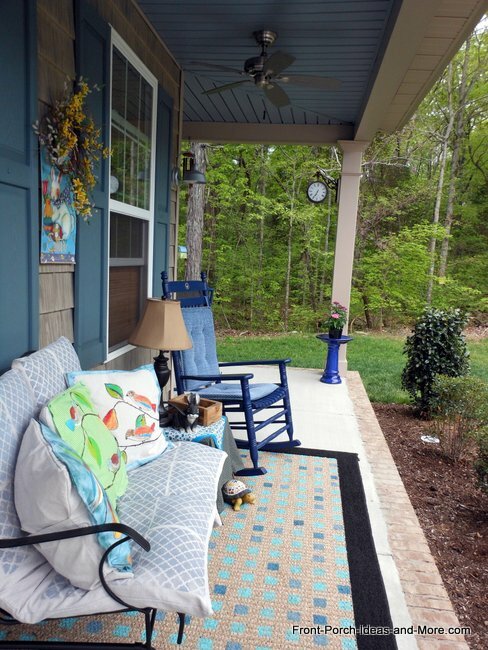 Will you be entertaining on your porch? Amy put out some wonderful munchies and succulents to host an Eclipse gathering. 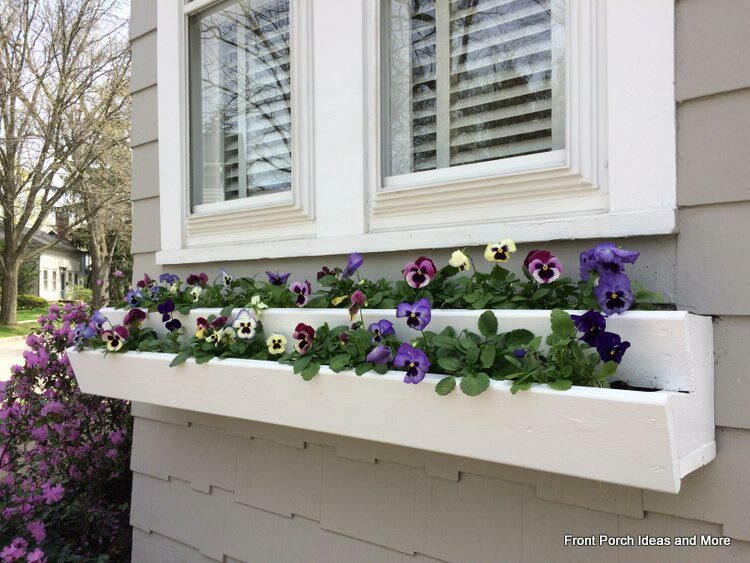 How will you be using your porch? That helps to define the decor you may want to include. 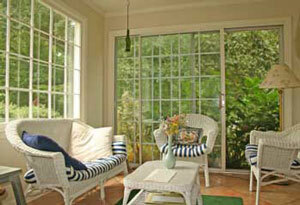 Knowing how you will use your porch will help you select the right furniture and accessories. 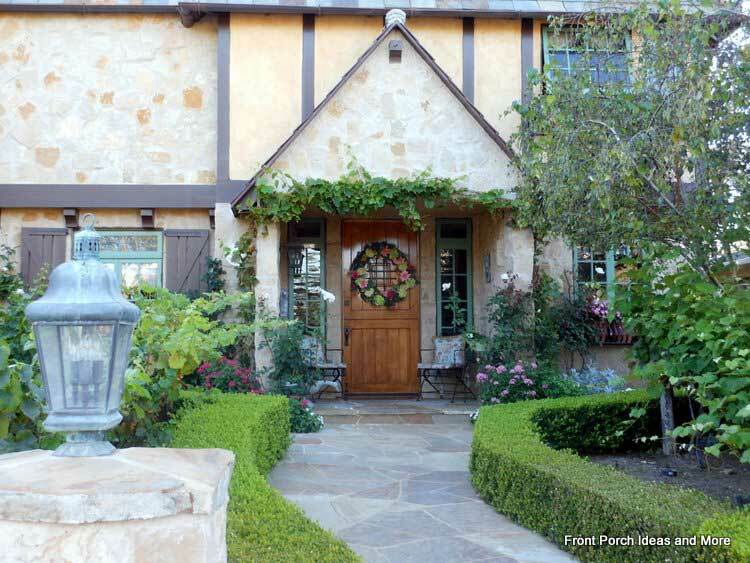 How will you use your porch the most? Will it be a gathering place for relaxing in the evening? Or perhaps a place to listen to the radio or share an intimate glass of wine? Do you want to create a private nook for reading or writing? Let's start with your front door. If you like the color it's painted, then you are off to an easy start. If not, repaint the door with a fabulous color using the ideas you gathered from decorating books, paint chips, or home store. Consider replacing your door hardware like door knobs and hinges if they show signs of wear. Replace your doorbell if it needs an over haul also. Friends and guests notice of these small improvements. 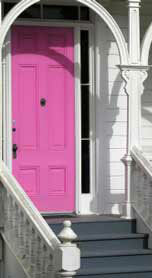 Next, consider painting the trim around any windows on your porch the same color depending on the effect you want. The nice thing about paint is that you can always repaint if it doesn't turn out the way you want. Mary and I know that so well. Next, work the furniture based on your theme and purpose. Want to use the furniture you already have? That's terrific! 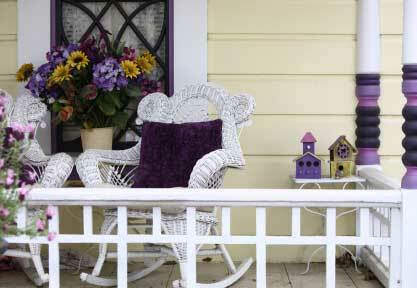 Most porch furniture can be re-painted to give it a fresh, new look. 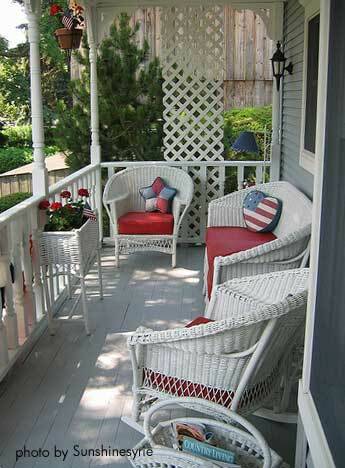 Or with such a variety of porch furniture on the market you won't have too much trouble finding just the right pieces. You may also get some awesome deals at flea markets or thrift shops. 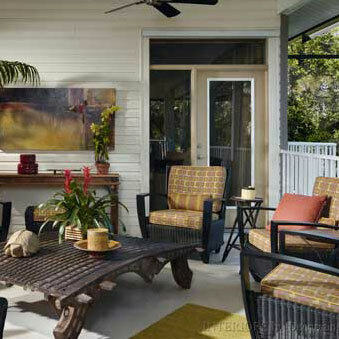 Our porch furniture guide will give you great ideas. For a quiet and intimate area, consider a comfortable chairs and cushions or a small outdoor sofa. For wine and cheese go for a small bistro table and chairs. 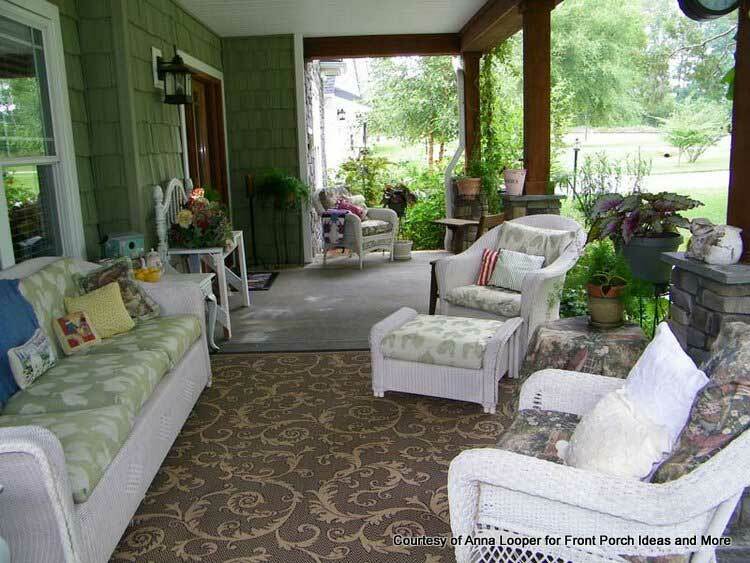 Talking about easy decorating ideas; a rug makes a porch so comfortable. You can paint a rug with a motif in a complementary color or add checks to a plain rug like we did here. Get creative, what about using a ceiling rosette. Available at home stores, rosettes come in different sizes and styles, can be painted any color, and can add a unique focal point to any porch. Want more easy decorating ideas? Have kids or grand kids? --- Get a few pieces of cedar, have each child paint a design on a piece, and then join them together at top and bottom with strips of wood. Now you have an original piece of artwork and a conversation piece. Like shopping at thrift stores or browsing garage sales? --- Keep an eye out for a unique item to use on your porch like an old bird cage or wrought-iron wall hanging. 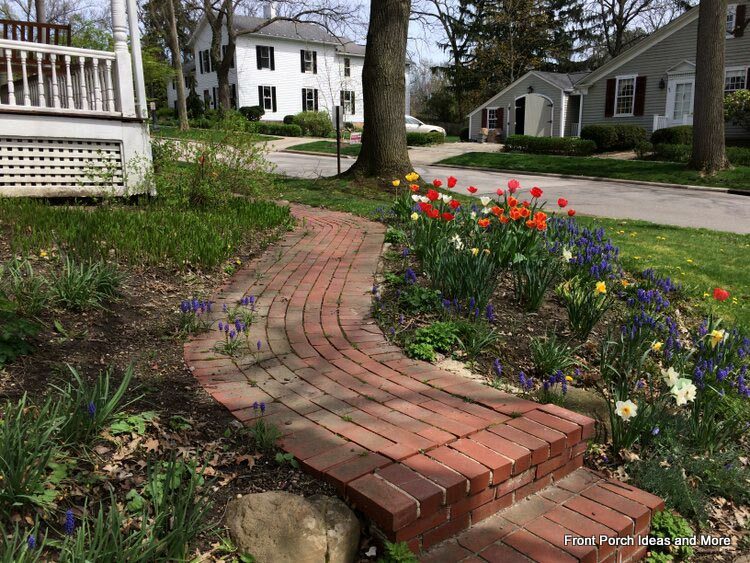 --- Plantings are one of the most overlooked but easy decorating ideas. 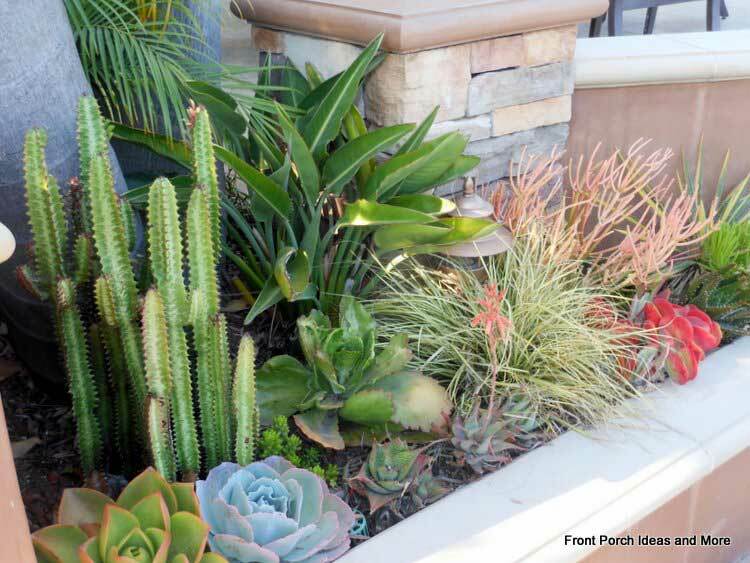 Choose plants you like in colors that complement your overall colors. You can make or purchase planter boxes, hanging pots, or railing planters in complementary, contrasting, or same primary color. If you follow these four concepts: color, theme, focal point and purpose, our decorating ideas will help take your porch from so-so to WOW! Easy decorating ideas are all around you if you are resourceful in finding charming pieces for your porch at garage sales, flea markets or even your dollar store. Use your creativity. Have your spouse, child or a friend help you and make it fun! See our response to Cathy's inquiry about decorating porch enclosures and decorating a porch that faces west! 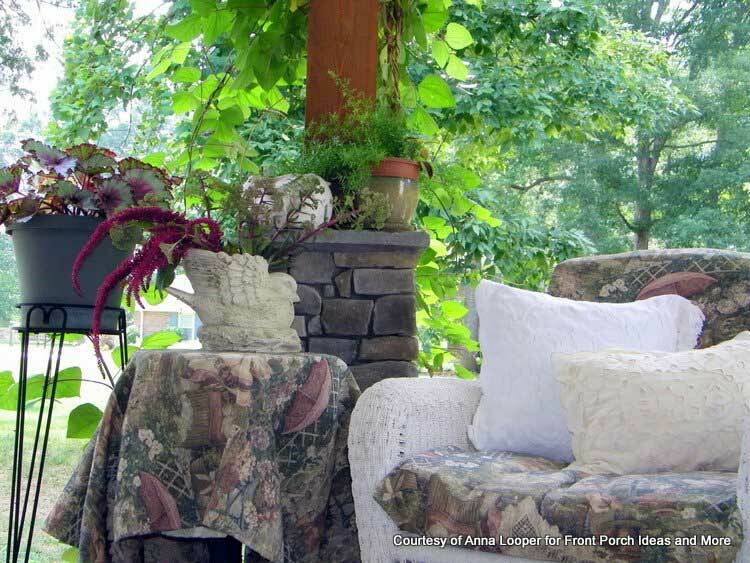 The above idea comes from Crye-Leike Realtors for their Monday makeover for porches. What a pretty, contemporary porch-scape. 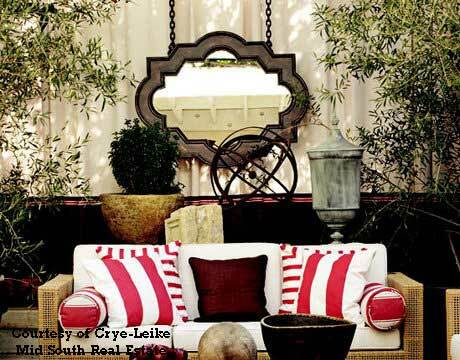 I also think the greenery, gorgeous pots and the striking red and white pillow collection add so much. As the folks at Crye-Leike say, this idea is a wonderful reflection of you and your summer guests. 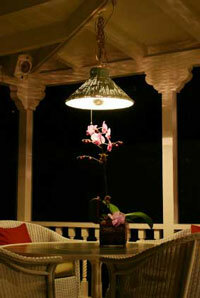 Ever think of lighting up your potted plants? 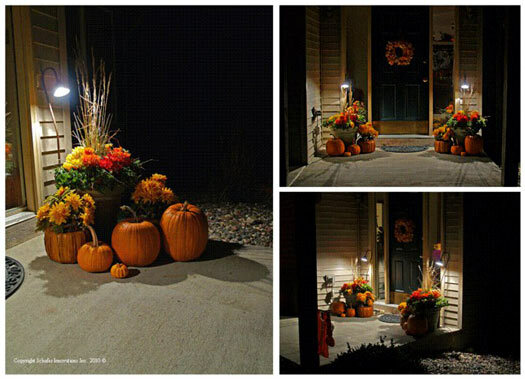 Wow, this awesome decorating idea comes from Steve at Plant Lamp USA. This is a stunning contemporary porch. See how the plants are lit up with a soft light. Does that not create a ton of ambiance? Steve, the inventor of these lamps, tells us that these type of lights (that attach to the flower pots) are a 110v plug-in-light. They have a mini transformer in the stand part but plug into an outlet or extension cord. You can use a plug in timer with them. He also has a hanging basket version as well. Typically homeowners leave on the lights until midnight or 1:00 am. 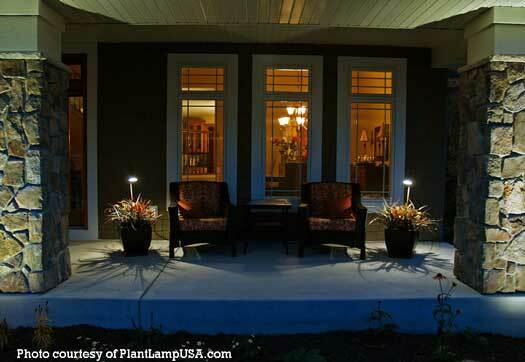 We love the sparkle and ambiance that these plant lamps add to the porch in the evening. Beautiful! Now enjoy another gorgeous picture.